Welcome to the first post in the ‘home tour’ series where I’ll be sharing the lake house with you room by room. 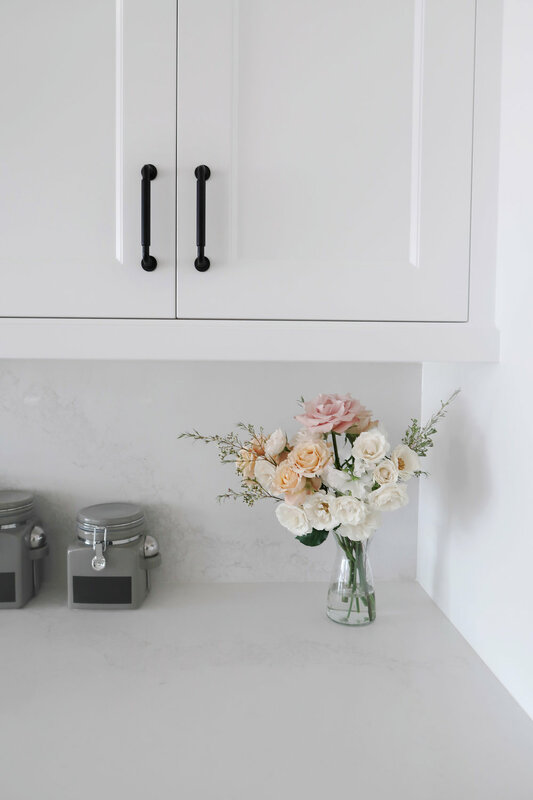 Today, I am sharing all the details about my parents kitchen. This is pretty much my dream kitchen, I wish it was mine, but for now, I am not complaining that I get to spend time in here on the regular. The kitchen has always been the heart of our homes and my parents really nailed it with this one. They went with an open concept kitchen that was entirely open to the dining and living room. It’s perfect for entertaining, especially on summer days. The window on the left in the pic above is actually a pass through window with a bar on the outside. My mom wanted it so she could pass lunches, snacks and food that’s meant to go on the BBQ through the window. Enough about all that, let’s get into the nitty-gritty details. The utensil holder pictured above is from crate and barrel. Deciding on the colour of the walls and kitchen cabinets was a labour of love, as was selecting the countertops. My mom, dad, their designer Ginette and I chimed in from time to time. We all went back and forth for ages holding swatches under different types of light until we all finally landed on ‘Cloud White’ by Benjamin Moore. They switched up the island with ‘Repose Gray’ by Sherwin-Williams which is such a nice compliment to cloud white. 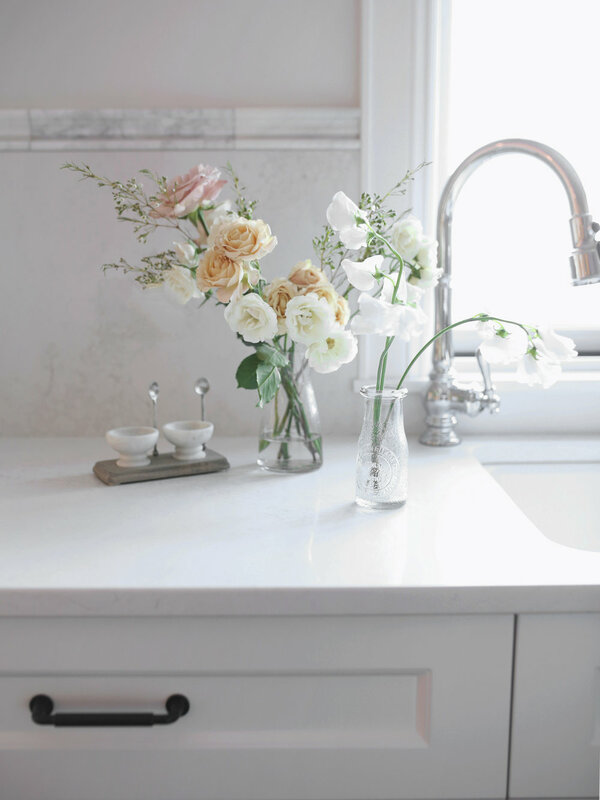 As for the counter tops, we wanted something as close to Carrera Marble as possible but that wouldn’t stain like marble. This was a long process, we all went back and forth on counter tops for the longest time and had actually landed on a different style until one day I went into a hair salon that had ‘Calcutta Nuvo’ by Ceasarstone countertops, I sent pictures to my mom and her and my dad saw it in person and fell in love with it and the rest is history. All of the cabinetry and tongue and grove ceilings were done by Martins Custom Finishing’s. They build everything on site and boy does it make a difference. They do such beautiful work. One of the coolest cabinet features in the kitchen is in the island behind the stools. The panels are actually functioning cabinets that offer extra storage space. The main kitchen sink is a Whitehaven tall apron enamelled cast iron sink in Sea Salt finish. The kitchen appliances include a wolf dual fuel 60” range with 2 full size ovens, 6 burners with large griddle. A sub Zero 36” fridge in stainless steel with professional series pull. Cove dishwasher (which currently needs the panelling to be applied. Sub Zero beverage fridge. The Reese Leather Stools in brushed bronze with a Berkshire Pewter leather cushion counter stools and Machinist Glass Cloche pendant lights in bronze are all from Restoration Hardware as is most of the furniture on their home. They worked really closely with the design team at Restoration Hardware on the entire house on everything all the way down to the decor. 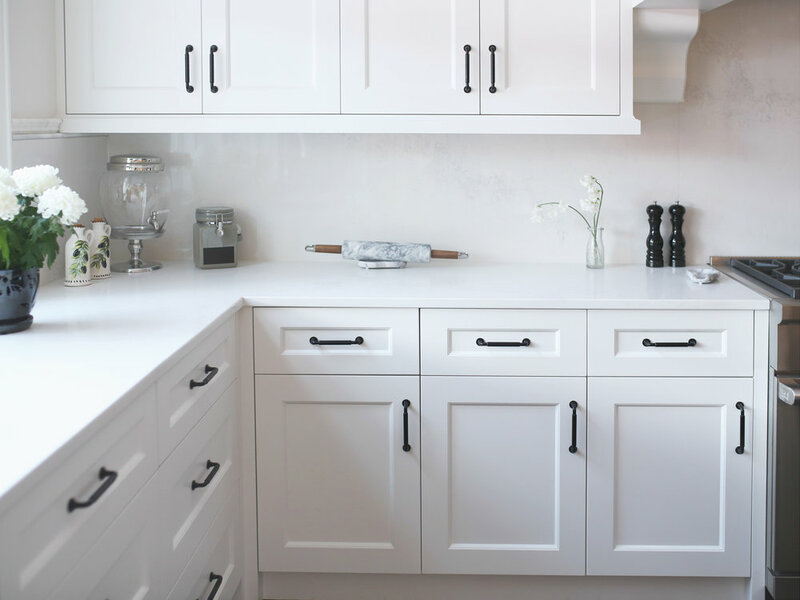 The pull knobs are all matte black and they’re from a Empire Kitchens & Bath in Calgary. I don’t know the name of them at the moment but will report back. The canisters are large clamp canisters in grey from Crate and Barrel and my mom bought out the entire store. If you can’t find these in-store it’s because she bought them all and currently has them stored in her mechanical room in case she needs extras. I am going to work on getting more information on the appliances…etc. in the kitchen but in the meantime if you have any questions please leave a comment below and I’ll do my best to get you the answers.